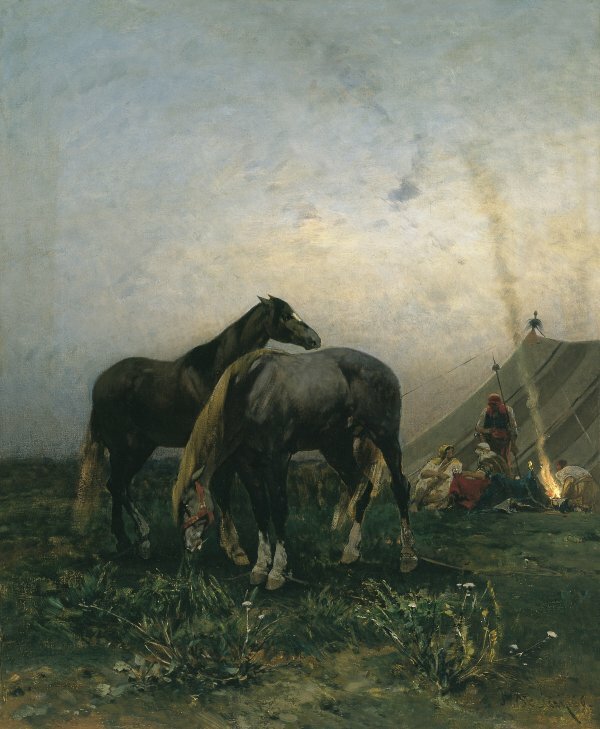 In a central position are the two horses resting free -one is browsing lazily on the rare tufts of grass sprouting among the stones in the foreground- almost as if they were the protagonists of the painting, rather than the group of men camping in the background, depicted just as they are getting ready for the night by lighting a fire opposite the tent, and are chatting and sipping a drink. The atmosphere is cold, almostmonochrome, built on shades of greys, browns and dull greens; despite this, the rising column of smoke which fades away and merges with the sky, skilfully rendering the particular atmosphere while at the same time giving depth to the scene, as well as the few members of the group absorbed in the approaching evening, and the fresh and quick brushstroke, all contribute to present the beholder with a highly suggestive work. The composition, masterfully painted from a low viewpoint, uses the rather uncommon technique of observation from nature, which necessarily concentrates the spectator's attention on the naturalist aspects of the subject and gives strength and credibility to the pair of animals set against the suffused light, as well as to the group of seated men. In fact, Pasini himself wrote in a letter in 1863: "In the East, everything is totally grey and arid, in particular in Persia and Asia Minor, so that in those places where vegetation does exist, it shines with a brightness we cannot imagine here in Europe, the green seeming like a Bengal light, not just because of the transparency of the air and the brightness of the sun, but also by the contrast with the grey dryness of the region." Here the painter moves away from the majestic representation of certain scenes by Eugène Fromentin and by his master Chassériau and, though he still uses his customary repertoire, he restrains from applying bright colours and from drawing with too much precision. Thus, he frees the composition from that stereotypical style present in the imaginary and literary orientalism of the time, while at the same time he shows a mastery in the art of painting from nature which is characteristic of his more mature years starting around the 1870's. Besides, the evidence of Pasini's attentive and curious observation constantly comes out, even in works painted a posteriori on the base of sometimes distant memories. Contrary to many of his colleagues who preferred painting in the quietness of their own ateliers, he felt the urgent need to travel to distant lands, to spend some time there, observing attentively and painting from nature. This desire remained unfulfilled until 1855, when he substituted Chassériau as the official painter in Prosper Bourée's diplomatic mission, which crossed Egypt, Arabia and Yemen, to end in the Persian gulf. The long sojourn in Teheran and the frequent excursions in the surrounding regions enabled him to discover extraordinarily beautiful places. Wherever he went, Pasini dedicated himself to open air painting, playing masterfully with light and shade and fixing on the canvas the colours, the buildings, the people, and everyday scenes. The images "stolen" from the East enabled him to escape from the grey European skies and earned him fame and prizes: in fact, he took part in the Parisian Salons of 1859, 1863, 1864 and 1868, winning a medal on each occasion and becoming in a short time one of the most popular orientalist painters in Europe.